So this 'sill plate' you're referring to is actually a piece of 2x4 wood lying horizontally on the floor, right? Is sill plate the bottom horizontal piece of wood to which vertical studs are attached in construction? I think I got it now. These 2 screws to be screwed into this Sill Plate on the outside of the water pipes are to secure the remaining parts of the Sill Plate, right? If I do that then the middle part of this plate that the 2 copper pipes are going through will easily come out, correct? This should give me an inch or so of extra room. Whats under the Sill Plate? What kind of screws should I use to screw into the sill plate, concrete, drywall? Once I do that, do I then cut the water pipes to a couple of inches above the subfloor? This way I could just put a 3/4X3/4X1/2 sharkbite tee, where I could then attache the Arrestor on the top side and the PEX 1/2 inch pipe to the middle part and just run both PEX pipes on the floor to the middle of the vanity and then do 90 to the back of the vanity and another 90 up through the bottom of the vanity to connect to the faucet. Do I understand this correctly? I would prefer to run a one piece of pex all the way to under the sink and then install the 1/2x3/8 quarter turn valves. With that setup, all I have to do is just place the vanity on top of it with cutouts in the sides of the toe kick where the pex would be. I am thinking to make a small service door behind the copper pipes where I have a small closet in case of needing of service anything. Where is this tile coming into play, it looks as though 90% of the cabinet is over the plywood. The old vanity was only 30" wide and was placed onto a some kind of linoleum tiles to the very left side of the space. The other right side of the 60" space was tiled up with white tile. For now I filled the un-tiled space with half inch plywood but the tiled part is just little bit higher then the plywood. I was thinking that placing a 60" wide 1/4 inch plywood would make everything leveled and also allow me to secure the PEX water lines under the vanity cabinet much easier. Is 1/4 plywood strong enough product to put a very heavy vanity with granite top on top of it? I don't think you need to worry about fastening the pex to anything, just let it lay on the floor under the cabinet. 1/4" plywood isn't enough to hold fasteners anyway, so trying to pin the pex down to it isn't going to get you very far. If you need to pin down the pex, you'll have to drill the tile and install expansion anchors or use screws long enough to go through the tile into the subfloor. OK. So just completed the copper to PEX conversion using Sharkbite connectors. I also installed a plastic 3/4 inch pex brackets to fill the gap around the copper pipes to make them more stable and prevent the pipes banging just extra precautions besides the arrestors. It looks like originally my cold water pipe was out of round as when I cut the pipe down now the Sharkbite spins freely, no more resistance. I also installed the water arrestors on both, hot cold water. Now I am testing for any leaks. I am just not sure how long should I wait to be sure there will be no leaks? From the pictures so far do you guys have any comments or suggestions for me? If you've got a leak, most likely it would be immediate and obvious. For good measure, if you wanted to leave the wall open for an hour or so, that would be fine. I'm not seeing any issues so far. Ya that all looks much better and will work well for your situation. Question; How long after second coat of 'Hot Mud 20 Minutes' can I start priming? As long as you slathered up the pipe cement and rotated the pieces 45*-90* when assembled, the drain should be fine. Yes, drains are tested after installation, by plugging the lowest point and filling from the highest point, but this is only done to new plumbing, nobody does it for stuff like this. We've discussed mud drying times on a number of occasions, when the color turns back to the original powder color, it is dry enough to do whatever you want to it. You should be fine on the drain lines if you glued the joints would not worry about it. If it was dry enough when you sanded it should be good for priming. If you sped up the sanding process with that hair dryer you may want to wait an extra hr just to be sure the inner surfaces are actually dry before priming.Hot mud is a chemical drying process so the dryer may have dried the outer surface but not all the way through. You're not actually "gluing" the pipes together, the glue is more of a solvent that melts the pipe so that the pieces fuse together. The point of the 1/4 turn is that it helps to remove air bubbles and mix the two pieces together, creating a better fusion. As long as you slathered both pieces good before assembly, you should be fine. A drain is not a pressure fitting, so the likelihood of leaks is extremely small. Also, how do I connect the sink to the main drainline ? Stick your tape against the wall on the right, measure out 6" at the front and back of the counter top. Now measure from the left wall to your marks, this will give you a definitive answer on whether the top will fit or not. You can also use cardboard or heavy paper to make a template of the top to transfer size and shape for altering your top. I am not a fan of notching drywall, IMHO, it just begs for problems when water on the counter travels over to the wall and enters through failed caulk joints, it's also just sloppy work. That is not to say that it isn't done on a regular basis when people can't get things to fit, it's just not a method I would recommend. Do you have splashes for the counter? If so, then notching the wall is less of an issue. What I'd rather see is you cut or grind off the end by the fraction of an inch you need to make it fit. Diamond blades are cheap and easy to use - outside. If this top has an attached back splash along the back you are going to have issues getting it in. You can not tilt one with attached back spalsh to one side and slip it in you need to basically hold it level and slip it back into the alcove and the straight down into the vanity. Because you have a drywall corner that will most likely be your tightest measurement and the top will have to slip in past that before it’s even over the vanity. Make sure you measure that distance if your top has a back spalsh attached as your top will have to be shorter then that distance to fit in. In a perfect world you can measure that distance and subtract another 1/8” and cut the top. Then what I do is use some small scraps of plastic laminate to set against the side walls as protection while place of the top in position . This keeps from having to scrape the wall and believe me you will if the fit is that tight. If your top does not have an attached rear splash then you can cut you top to fit the walls at the vanity and then by slipping it in on an angle until it’s pretty much all the way back. Then you can lower the high end into place. You will still need the top to be slightly smaller then the opening . The worthy of these tips make placing them in an alcove more tricky. I wanna install a 4 inch backsplash all around on the three walls. Can I use the stick-on type that you stick on to the wall and then fill the gaps between tiles with grout. They come in sheets with adhesive on one side. Can I use that for easier install? I dont wanna install the faucet yet until I install the backsplash for easier installation of the backsplash. But when I am ready, do I put plumbers putty between the faucet and the top? The faucet has a plastic seal. Well I think up in Canada you guys tend to do all your drain plumbing in ABS up to the tail pipe from the sink drain. The tail pipe of the sink drain interfaces with the larger ABS pipe using a trap adapter, a compression type of connector with a slip-joint tensioning ring, that cements onto the end of the ABS pipe stub. Here in the states it's more common for the ABS (usually 1 1/2") to end right when it immediately enters the vanity, and that is where the same trap adapter mentioned above connected. The rest of the fixture waste plumbing (P-trap and extension pieces) are 1 1/4" poly-propylene (PP) pipe pieces connected together with slip joint compression couplings. It matches the same thickness and diameter as the tail piece of the sink drain. They're sold in kits, and drop-dead easy for DIY-ers. Although some plumbers do prefer to use ABS all the way up to the sink drain tail piece, as what seems more common in Canada (maybe it's code up there?). Since you'd be dry-fitting and then cementing all your ABS fittings, be sure to get a P-trap with a bottom clean-out cap. I think there are also P-traps with both the bottom clean-out cap and a take-apart style of connection where the P-trap swivels on one side. Yeah those stick-on tiles are a great idea. Friend of mine just did his kitchen backsplash with those. Actually he had sheets of just normal glass tiles, but then he stuck them on using separate sheets of adhesive with a peel-away backing on both sides. It is way less messy then troweling on adhesive. If you have gouges in the wall, I would fill them in with joint compound first. Spackle is really just for really small holes. You can get small containers of joint compound. Or get a small bag of plaster of Paris and mix some of that up in a dish with water and use that. Sounds like it won't be too critical because you're going to cover it all with a tile backsplash anyway. But before you start tiling, be sure to prime paint those repaired spots first, just so the adhesive can stick to it good. Plumbers putty isn't necessary if your faucet has a gasket. Just tighten those screw-on washers good and tight, and you should have a good water-tight seal. The sink drain is where you for sure need to use plumbers putty. I'd repair the walls with mud, you've got to break it out to fill where you carved out the wall for the top to fit anyway, you might as well use it to skim the scuffs on the other wall. Stub the 1-1/2" drain out under the sink and install a slip joint reducer to 1-1/4"
From there, you plumb the tail piece and trap arm into the slip joint. RE: tile. I assume you're using ceramic tile and not vinyl peel-n-stick. I don't have experience with self adhesive tile like that, and would be a bit concerned that they'd stay put. Smearing a little mastic on the back of a tile is no big deal and will likely provide a much better bond. Grout the joints and caulk the corners and where it meets the counter top. RE: Faucet install. Plumbers putty can stain stone, most installers opt for silicone, I would use a good quality latex tub and tile caulk. I generally grab Dap products, they are the most readily available to me and have proven themselves to work well. Thats where the thin plastic laminate on the wall works well to give you a surface that can protect the drywall. Oh well its done now. Fix it up with mud and repaint. 1-1/2" ABS or PVC (whatever you have now) and then the slip joint reducer to fit the tail piece. Also use a trap with the screw off drain/clean out. I have never used the stick on tiles as I think they look pretty fake (any I have seen). The few tiles you need will cost very little and just mastic them on the wall. Make all your cuts in the back corners BTW. With that plastic base gasket I would not even mess things up with silicone. And no plumbers putty for sure. I have never found the need for one of those clean-out nuts on the bottom of a trap, it's really only there to drain the trap should you ever need to pull it, but a bucket/dishpan/mud pan will catch any water in the trap, so IMO, you don't need it. Maybe Shannon knows of a different use for it? You can plumb 1-1/2" all the way to the sink drain neck and put the reducer there if you wish, it doesn't matter if the trap is larger than standard, what matters is that it conveys water leak free. The one thing I'd highly recommend is that it is a screw together trap and not a glued one, this will allow you ease of installation, alignment, and later serviceability that glued pipe doesn't. That would either be a drain neck or drop tube, depending on your preference. I don't think I've pulled a vanity drain apart that wasn't full of stinky sludge and hair, so the water is pretty much the least of my worries. 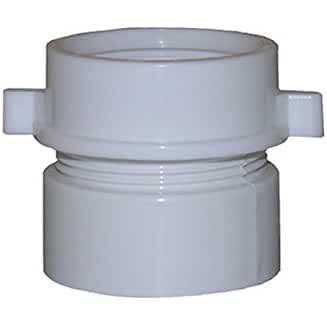 Both PVC and ABS trap adapters exist to connect to either 2" or 1 1/2" ABS or PVC pipe to accommodate connection to 1 1/2" slip-joint waste assemblies (kitchen), and both a PVC and ABS trap adapters exists to connect to 1 1/2" ABS/PVC pipe to accommodate 1 1/4" slip-joint waste assemblies. Note that sometimes these trap adapters are called "marvel connectors", for whatever reason. I find that because these slip joint connectors look so similar I grab the appropriate sink tail piece from the shelf and make sure it fits the slip joint I have grabbed. Many times they get mixed up in the bins and you could be reaching into the right bin but grab the wrong size. Now. Thanks to your input I was able to finally connect the the water and drain to the sink. So far no leaks. 1. After placing the vanity top on I noticed that the back wall is bowed and almost 1/4 of an inch space exists between the granite top and the middle of the back wall. How do I go about installing backsplash tile on the back wall if left it alone? 2. In the mean time can I seal the gap with silicone to prevent water from splashing behind the vanity top? 3. What kind of tiles would you recommend for easy cleaning of water and soap and toothpaste splashing? 4. My faucet is 7 inches high. How high should the backsplash be? 5. I need a new bottom cover of the vanity I think it's called kick something? Where do I shop for that? Do I just use a piece of plywood and just paint it? Thank you Spruce for the tip on turning the PVC connection while gluing. It really helped. I was actually able to slip the connector in little farther this way and it didn't fight me back as much trying to come out.